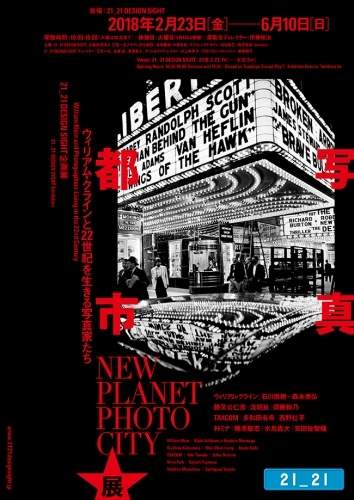 21_21 DESIGN SIGHT will hold an exhibition, "NEW PLANET PHOTO CITY - William Klein and Photographers Living in the 22nd Century -" from February 23, 2018. We welcome the photography critic and art historian, Toshiharu Ito, as the exhibition director. Ito is the author of many books about photos and art and he has also worked on the planning of exhibitions. It will soon be two centuries since photography was invented. An astronomical number of photos have been produced in this period of nearly 200 years, along with innovations in technology and networks, drastic changes have occurred in their forms of expression, their production techniques, and the relationship between the creator and the recipient. Leading 20th century photographer William Klein had a decisive influence on modern visual culture with his expression that went beyond genres such as photography, movies, design and fashion, and his works capturing the cities of the world, including New York, Rome, Moscow, Tokyo, Paris, etc.